Speaking in Maine next takes us to the University of Maine in Orono for the 2018 George Mitchell Lecture on Sustainability. 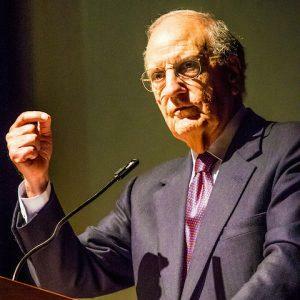 Senator George Mitchell delivers the lecture titled, "Healing Our Democracy," in which he advocates consensus and deliberation to avoid increased tribalism in politics. During the lecture, Mitchell draws on his decades of work in public service and as a skilled negotiator explores how we can increase our capacity for solving problems through deliberation and consensus-building in local communities. He will examine various economic, social and political factors that are contributing to the high level of polarization and frustration evident in America, and focus on promising strategies for addressing this challenge, beginning in Maine. Senator George J. Mitchell is one of the most widely recognized and inspirational leaders in Maine. He served as the Democratic senator from Maine from 1980 to 1995 and Senate majority leader from 1989 to 1995. He learned the workings of the U.S. Senate in the 1960s, when he served as executive assistant to democratic Sen. Edmund Muskie. In 1980, when Muskie resigned to become secretary of state, Mitchell was appointed to fill the vacancy. During his time in the Senate, Mitchell was lauded for his unsurpassed integrity and ability to find common ground. The lecture is co-sponsored by UMaine’s Senator George J. Mitchell Center for Sustainability Solutions, School of Economics, UMaine Cooperative Extension, Maine Sea Grant, Rising Tide Center, Political Science Department, and Department of Communication and Journalism.